[U.S. CONSTITUTION]. Newspaper. The Pennsylvania Packet, and Daily Advertiser. October 1, 1787 (No. 2700), Philadelphia: John Dunlap and David C. Claypoole, including the September 28 resolution of the Confederation Congress to send to the states for ratification the recently completed U. S. Constitution. 4 pp., 12 x 18¾ in. “The United States in Congress Assembled. Friday, September 28, 1787. The convention called to revise the Articles of Confederation met in the Pennsylvania’s State House in Philadelphia starting on May 25, 1787. After many delegates agreed that the Articles could not be sufficiently improved, they started to draft an entirely new structure. Maintaining their pledge of secrecy, after months of private deliberations over trade, defense, taxation, representation, separation of powers, the election of a president, the slave trade, international relations, and many other issues, the proposed United States Constitution was signed by thirty-nine of the fifty-five delegates on September 17. 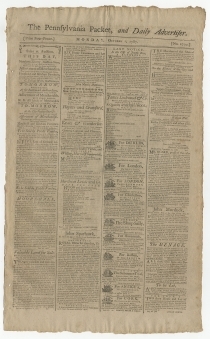 Two days later, the Constitution was first published by the Pennsylvania Packet and four other Philadelphia newspapers. The cover letter sent by George Washington, president of what came to be called the Constitutional Convention, submitting the plan to Arthur St. Clair, the President of the Congress of the Confederation in New York, was also printed then. Congress received and read the proposed Constitution on September 20th. As a sampling of their deliberations, William Grayson of Virginia thought it was too weak, while Richard Henry Lee of Virginia and Nathan Dane of Massachusetts thought it was too strong. On September 27, Virginia’s Richard Henry Lee proposed that the Constitution be sent to the executives of each of the states. A Delaware representative quickly added, “in order to be by them submitted to conventions of delegates to be chosen agreeably to the said resolutions of the convention.” Ten of the twelve states then represented in Congress voted in favor. Before Congress adjourned for the day, the majority of Virginia’s representatives and a minority of New York’s representatives also indicated their support. On September 28, Federalists holding out for a unanimous vote found a way to compromise with anti-Federalists: Congress unanimously resolved to send the Constitution to the states, but without any recommendation or approval. Arider from New York City arrived in Philadelphia with the resolution that same day. 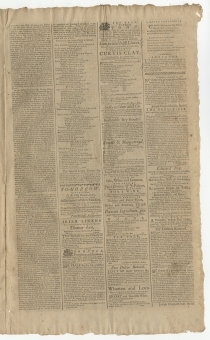 The Pennsylvania Packet, or the General Advertiser (1771-1839) was founded by John Dunlap in late 1771 as a weekly newspaper in Philadelphia, though it relocated to Lancaster during the British occupation of Philadelphia in 1777-1778. 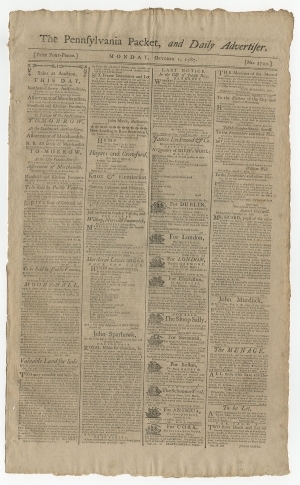 On May 30, 1783, Benjamin Towne turned the Pennsylvania Evening Post into the first daily newspaper in the United States. However, with Towne branded a traitor and forced to hawk his own papers on the street, the newspaper collapsed the following year. 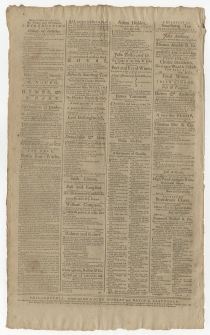 John Dunlap and David Claypoole then made their Pennsylvania Packet the first successful daily on September 21, 1784. 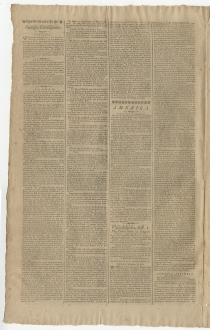 It underwent numerous name changes in the 1790s until sold in 1800 and renamed Poulson’s American Daily Advertiser.